Congruence and similarity proofs through transformations are new to most teachers with CCSS-M. I have noticed instances of them making teachers freak out. But they are actually delightful, once you understand what is expected. I find transformations a much clearer way to show why figures must be congruent and similar than with the axiomatic approach most of us used to use. 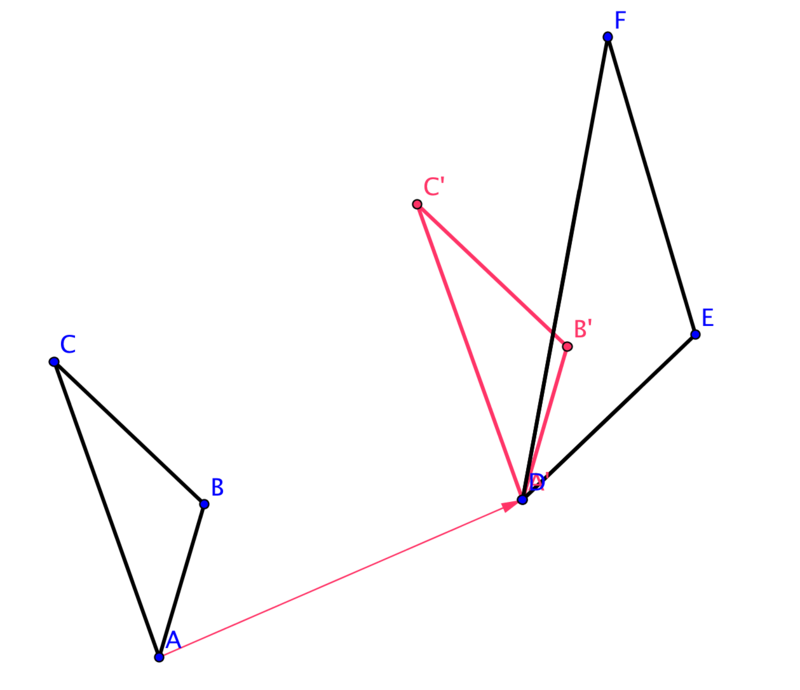 This is a task called Similar Triangles from Illustrative Mathematics. If you can do it, you've proven AA, so, hey, pretty darn useful, too. If you give it to teachers, they will mostly freak out. You'll hear things like "This would be so much easier on a coordinate grid." "I don't know what I can assume." "What definition of similarity are we using?" 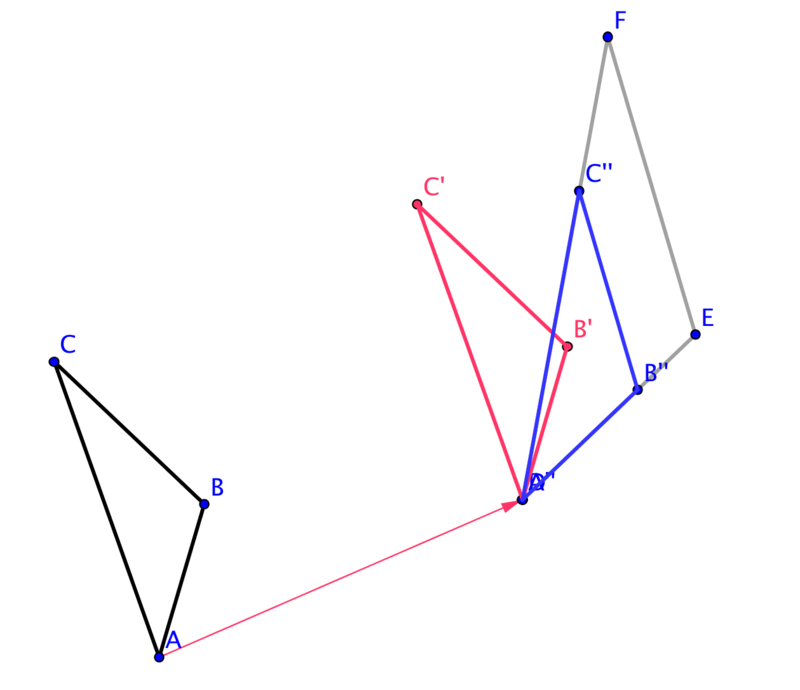 So, clarify that the only givens are the congruent angles. And that similarity is defined as one figure being the product of a sequence of transformations of the other figure. Still, they are freaking out because they don't know what to put. Here is a magical, yet still general, procedure that will unlock their willingness to engage with this task. It was shared with me by Dr. Kristin Umland from University of New Mexico, who is a badass. Here is what it will look like. Colored pencils are very helpful. As a result of the rotation, A''B'' will lie right on top of DE, and A''C'' will lie right on top of DF. I know this because it was given that angles A and D are congruent, and angle measures are preserved in translations and rotations. I know this final transformation to triangle A'''B'''C''' will land precisely on triangle DEF. 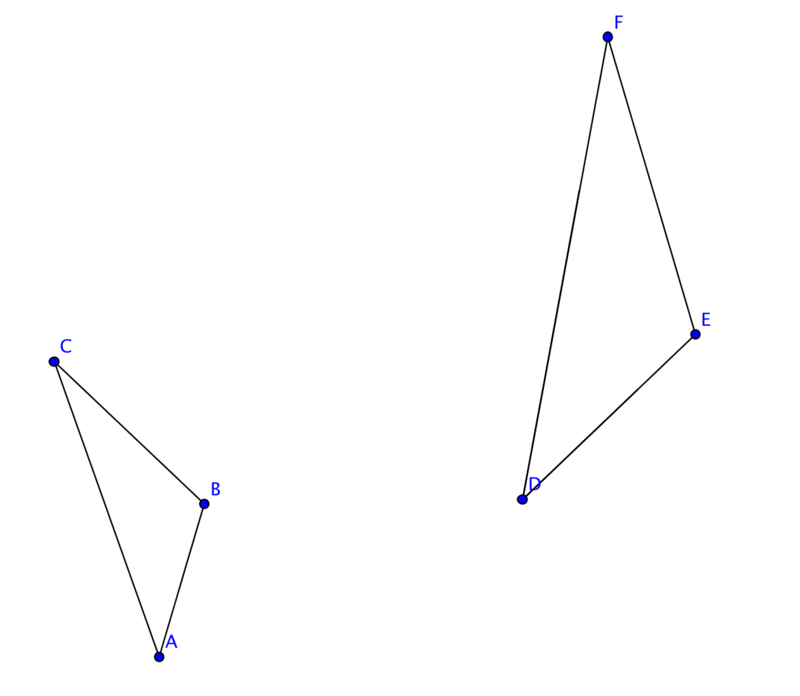 The dilated segments will lie right on top of DE and DF, because the center of dilation was D, so dilated segments that include D will grow in their original direction. B''' will land right on top of E, because of the scale factor I chose, and because distance was preserved in the translation and rotation. 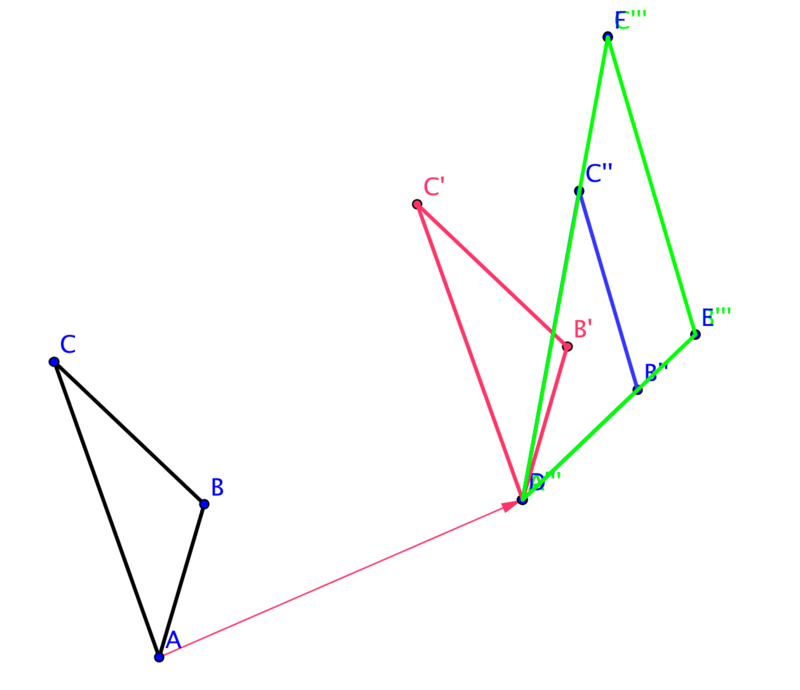 Since it was given that angles B and E are congruent, and angle measures were preserved in all the transformations, B'''C''' will be right on top of EF. D''' will land right on F, because the two dilated segments have no choice but to intersect at F.
Objection: "Aren't you just teaching another procedure? Isn't that what we are trying to get away from?" Response: State the transformation, state the object, draw the intermediate step doesn't feel like an evil procedure in the evil sense of the word. It's not actually dictating what you'll write. It's more a framework. The shallowest of footholds - something that can be used to gain purchase, and free you up to talk about the details of the proof. I wouldn't feel evil for teaching it. Objection: "This is so stupid! Why are we making kids learn this?! At no time in my adult life have I had to prove that two shapes are similar!" Response: I believe you, and I don't think anyone is suggesting that writing Euclidean proofs, itself, is a necessary life skill. The thing we really want kids to learn is how to reason logically and communicate their reasoning clearly. Geometry is a context for that, and has been for over 2000 years, because it is a pure abstraction, and you don't have to account for the limitations of measuring devices or friction or any other real-world complicating factors, so we can focus on the argument itself without any distractions. If you don't think that learning to reason logically and communicate your reasoning is a desirable skill, then you and I aren't going to have a very productive conversation. Objection: "The students I work with might be able to follow those three steps, but no way can they complete the argument like you did. The bit about preserving distances and the argument for why C''' and F are coincident." Response: Yeah, maybe. But the three steps are a good chunk of the proof, and if all of my students could do that, I'd be about 75% happy. Let's think about what students need to be able to do to complete just the three steps: visualize and draw the outcome of a transformation, communicate the details of a transformation clearly, and understand which attributes are preserved under transformation (whether they actually state them or not -- but with practice, I think most could make progress stating the argument with less formal language). For test-taking purposes, I'd be willing to bet that communicating the three steps clearly will count for at least half the available credit. The rest is difficult, and comes with practice and intellectual maturity, I'll totally concede that. But, if we're being honest, all practicing teachers make our peace with the reality that not 100% of the kids learn 100% of what they are supposed to learn, so I don't see why this should be any different. Objection: There is too much going on here! The kids have to remember all the details for describing transformations, and then they have to draw them accurately, on top of constructing this argument. Too hard! Response: Yeah, it's a lot. You'll need to probably spend an entire unit before this where they just learn how to describe transformations with precision. However, technology can alleviate some of this burden. For example, Khan Academy is creating some interactive modules where the transformations can be performed through button clicks. I'd cite this as possibly the first example I've seen of KA doing something right. I'd definitely use these modules, selectively, while teaching this, especially for any students with motor-control difficulties, but also for all students to have opportunities to focus on the reasoning and not worry about drawing. I've heard rumors that Desmos is cooking up something similar, so stay tuned for that. An exercise for you: if you'd like to practice a transformational proof with a task that's suitable for, say, advanced high school students and up, try this: Show that when a rectangle is dilated by a factor of k, its perimeter changes by a factor of k, and its area changes by a factor of k2.